Hand-carved by a 5 Jotas master carver from a acorn fed 100% ibérico loin. 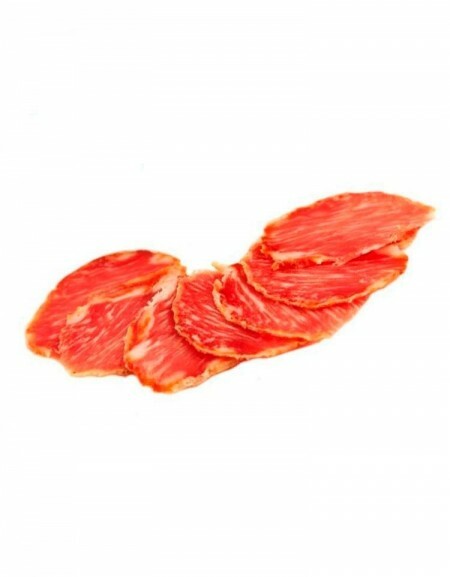 The Acorn fed 100% Ibérico Loin is cured, dried meat made in a completely artisan manner from a whole piece that corresponds to the lumbar muscular mass. It is known for a powerful and fragrant aroma, a slight maroon and ashy colour with a very well-defined shine and a mild paprika flavour with hints of smoke. An authentic 5 Jotas delicacy ready to delight. Cinco Jotas acorn-fed 100% ibérico loin is one of the Spanish gastronomic references. The ham comes from pure Iberian pigs fed exclusively on acorns. A rich and healthy product that is part of the Mediterranean diet. Made from a selection of the best pure Iberian pigs, range-bred on the meadows of the Iberian Peninsula. The pigs receive exceptional care throughout their lives and are fed exclusively on acorns during the Montanera season. The acorns provide the animals with a high percentage of oleic acid which gives the loin ham features that have been scientifically proven as healthy. The Cinco Jotas acorn-fed 100% ibérico loin helps reduce harmful cholesterol and is also rich in omega 3, omega 6 and omega 9. El servicio y transporte inmejorable y el jamón tan bueno como esperaba así que continuaré comprando sin lugar a dudas.